We’d love your help. 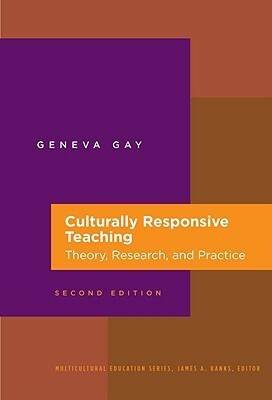 Let us know what’s wrong with this preview of Culturally Responsive Teaching by Geneva Gay. To ask other readers questions about Culturally Responsive Teaching, please sign up. While I appreciate being made to see the big picture (in this case, the need for CRT and descriptions of what CRT is) I would have liked more specific classroom examples. Also the references to a disproven theory "learning styles" is a concern. This was a fine overview. I would prefer more techniques and less theory, but that's not what the author was trying to do. Could serve as a starting point for more research. This book is a great introduction to culturally responsive pedagogy. Gay presents an impassioned plea for reform in order to improve the performance of students of colour in U.S. Schools. Her lessons apply in other areas as well including mine. Teaching students from a different culture than ours is challenging and Gay's book helps illustrate how teachers can leverage the students' own strengths to build on their success. Gay's book provides a great counter argument to the pervasiveness of colour This book is a great introduction to culturally responsive pedagogy. Gay presents an impassioned plea for reform in order to improve the performance of students of colour in U.S. Schools. Her lessons apply in other areas as well including mine. Teaching students from a different culture than ours is challenging and Gay's book helps illustrate how teachers can leverage the students' own strengths to build on their success. Gay's book provides a great counter argument to the pervasiveness of colourblind racism that permeates education. This book has some practical ides, research examples, and case-studies. Also, there are references for further study for each of the sub-sections. Wonderful! This book was written as a guide for current teachers in diverse classrooms. The chapters are divided helpfully throughout the book; making distinctions with pedagogical advice, the power that caring about culture, communication, curriculum, and praxis. Geneva suggests systemic changes and reform throughout the classroom and curriculum, especially across all school levels. There is no way I could have read this straight through. But, despite how much I hate admitting it. I enjoyed reading parts of it for class and it made me think. Yes, this is the same review as the other one. I hate that I didn't hate this book more. This one's chapters are too long. Bit more about the standards movement. One of the most powerful and insightful books I've ever read. It would totally change your view of being a culturally responsive human being, not just a teacher.